I see London, I see France! Our Perfect Pantaloons are so lovely who cares if they peek out! This old-school undergarment features drawstring waist to reduce bulk at the waistline and ensure a custom fit. Measures 26 inches from waist to ruffled elastic hem. Fashioned from 100% cotton in white. Imported. Machine wash cold. Available in sizes S-2X. Also offered in several colors. Usable item under other clothing. Wrinkle easily and thin. But drawstring really helps get a good fit. Worked fine under my outfit. First time buyer. Excellent experience. Great products. Will buy, again, in the future. Wanted a vest that had a classic, traditional look that also could serve under a business suit or sport coat at the office. Found it! This holster does not fit the New Ruger Vaquero very well. Too loose. 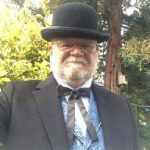 I was the BEST dressed Victorian gentleman in the play! All commented on how authentic I looked. The women in particular kept glancing my way!